Multi award-winning Milltown House Dingle is the iconic luxury accommodation property on Dingle’s Waterfront. 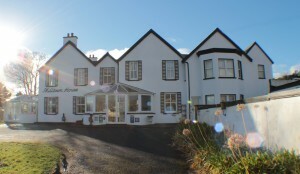 Milltown offers 10 huge en-suite rooms with glorious views of the Atlantic Ocean and Dingle Bay. We are on the fringe of Dingle village, only 10 minute walk to the centre of town. We offer a first-class accommodation experience, a serene private environment, and a hearty Irish welcome. We enjoy a decor that tastefully blends the 120 year old history of this traditional Irish House with Milltown House’s year long flirtation with Hollywood stars and directors in 1969. We have invested wisely in a new library-bar, the ‘Robert Mitchum Bar’ which is fully licences and enables us to be one of the only Guesthouses in Dingle to be able to legally offer our guests a cold beer or a nice glass of wine after a day of travelling or before going out to enjoy one of Dingles’ many fine restaurants. We offer all guests a complimentary drink on arrival. Guests also receive a free traditional Irish breakfast with made-to-order dishes. Our breakfast chef is also a proud cook to one of the top restaurants in town. The Milltown House is owned by Stephen McPhilemy and Patrick Wade. Stephen is 100% Irish and Patrick is from California. They met 20 years ago in Dingle. Both loved the scenery, lively pubs, and community. This led them to open the Milltown House. The Milltown House now has a traditional Irish atmosphere with a touch of California. Dingle is a must-visit in Ireland and the Milltown House provides the perfect stay. The bed and breakfast is kid friendly with a large yard and lovely Irish Wolfhound that loves to visit.